Interactive driving directions are available HERE, or viewable on the map below. Take exit 249D for North Avenue or 249C for Williams St. Turn right onto North Avenue and continue 0.8 miles to Northside Dr. Turn left onto Northside Drive. Travel Northside Drive 0.5 miles to Ivan Allen Jr Blvd. 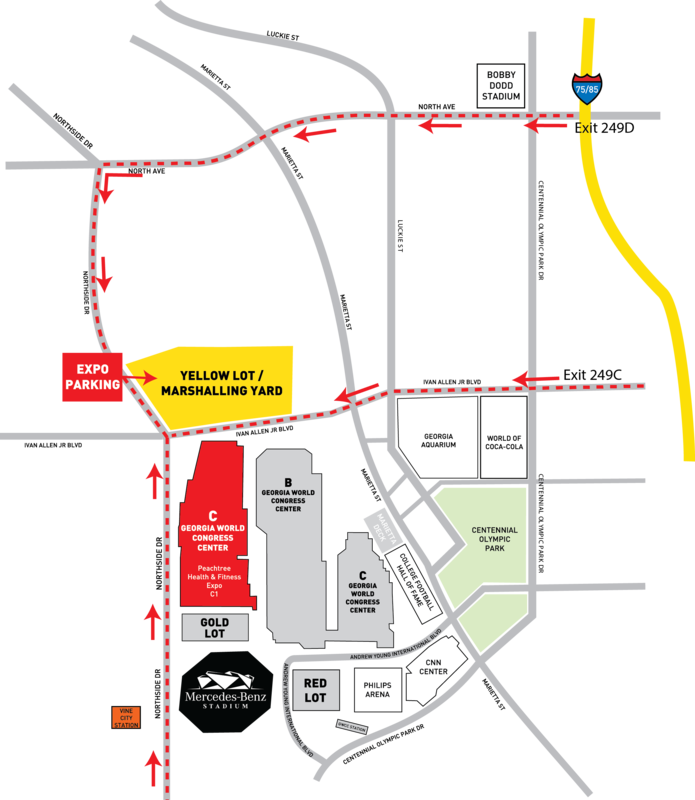 Turn left onto Ivan Allen Jr Blvd to access the Yellow Lot. To park in the Gold Lot, stay on Northside Drive and cross over Ivan Allen Jr Blvd - parking is on the left. Take Exit 246 for Fulton St/Central Avenue. Turn left onto Fulton St and drive 0.7 miles to McDaniel St. Turn right onto McDaniel St and travel to Northside Dr. Turn right onto Northside Dr. Continue on Northside Dr for 1 mile. GWCC Building C is located on your right after you pass the Georgia Dome. Expo parking is available in the Gold lot on Northside Drive immediately before Building C. To park in the Yellow Lot, continue on Northside Drive and turn right onto Ivan Allen Jr Blvd. Parking entrance is on the left. Take Exit 56A for McDaniel St. Turn left (north) onto McDaniel St and drive 0.4 miles to Northside Dr. Turn right onto Northside Dr. Continue on Northside Dr for 1 mile. GWCC Building C is located on your right after you pass the Georgia Dome. Expo parking is available in the Gold lot on Northside Drive immediately before Building C. To park in the Yellow Lot, continue on Northside Drive and turn right onto Ivan Allen Jr Blvd. Parking entrance is on the left. Take Exit 56B for Ted Turner Drive SW. Turn right onto Ted Turner Drive. Go 0.5 miles and take a left onto Mitchell St. Go 0.4 miles and turn right onto Northside Dr. GWCC Building C is located on your right after you pass the Georgia Dome. Expo parking is available in the Gold lot on Northside Drive immediately before Building C. To park in the Yellow Lot, continue on Northside Drive and turn right onto Ivan Allen Jr Blvd. Parking entrance is on the left. If using GPS for directions to the GWCC, please DO NOT use Andrew Young Blvd. The address of 362 Ivan Allen Jr Blvd. Atlanta, GA 30313 will point you directly to the Marshalling Yard and Yellow Lot. You may also use the address of 235 Northside Drive, Atlanta, GA 30314, which will direct you to the Blue and Yellow Lots on Northside Drive. Parking is available in the Yellow Lot at a discounted rate of $10/day if pre-purchased (see link below); otherwise, the daily rate is $15. Pre-Purchased Parking: Available HERE. Select Georgia World Congress Center, followed by the Peachtree Health & Fitness Expo option and then choose the appropriate day and parking lot. MARTA is an excellent option for getting to the expo! We highly recomend using the Vine City Station instead of Dome-GWCC-Philips Arena-CNN Station. Accessed from all blue and green lines, Vine City Station is a short walk (0.4 miles) to Hall C1 at the GWCC. Directions from Vine City Station: Exit the station onto Rhodes Street, turn right (east) and walk 1 1/2 blocks to the intersection of Northside Drive. Turn left (north) onto Northside Drive and walk 3 blocks to Bldg C.